2. This machine can produce enough finished labels for several workers to work at one time and achieve high operational efficiency. 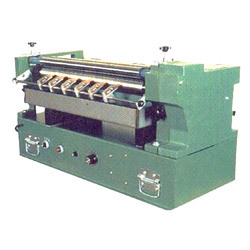 Any kind of glue can be used by this machine and one load of glue for this machine will keep a long time operation before the next load of glue is required. 3. Glue regulator is designed for different thickness of glue applied. 4. The small machine body is easy for moving and its construction of stainless steel is easy for maintenance. It looks always brand new. Food processing, mosaic making, pharmaceutical processing, book binding, petrochemical processing, trade labelmaking, paperboard making, electronicplants, printing shops, and plants for making suitcases, belts, purses, shoes, and plastic products. (1) Before stopping the machine, those cement and paste must be cleaned (The storage tank and its component can be cleaned individually). (2) After starting and the machine is not rotating for then, to check the fuse is burned off or not. 1. Model: RW-360-5. Gluing width: 500 mm. HP(DC)DC: 1/4. Voltage: 110/220. H.Z 50/60. L x W x H(mm): 800 x 400 x 400. 2. Model: RW-360-6. Gluing width: 600 mm. HP(DC)DC: 1/4. Voltage: 110/220. H.Z 50/60. L x W x H(mm): 900 x 400 x 400. 3. Model: RW-360-8. Gluing width: 800 mm. HP(DC)DC: 1/4. Voltage: 110/220. H.Z: 50/60. L x W x H(mm): 1100 x 400 x 400.